CRAIC Technologies: Australia and New Zealand. Microscopes and Microspectrophotometry. 20/20PV, XL Film Thickness Measurement, Flex and 308PV Microscope Spectrophotometer. Elixir Trace Evidence Analysis, MP2 and CoalPro, UVM 1 and rIQ. 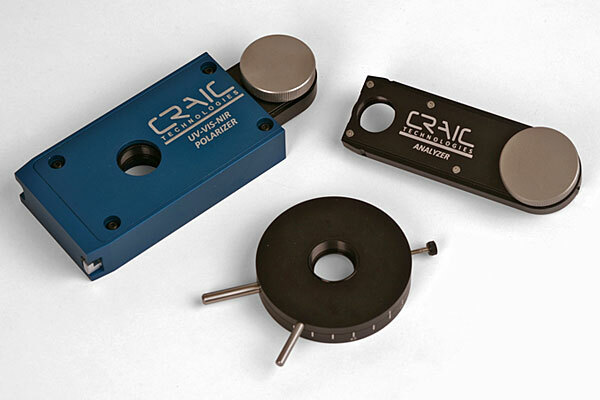 CRAIC manufactures both scientific grade systems in addition to specialised systems for industries such as semiconductor inspection and pharmaceutical metrology. 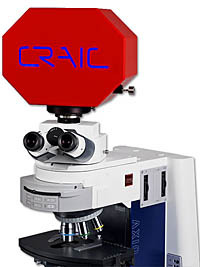 CRAIC also makes NIST Traceable Standards, the only ones in the world specifically designed for microspectrophotometers, and specialised software packages. This bespoke instrument incorporates the latest technological advances in optics, spectroscopy and software to deliver the superior performance with unparalleled speed and capabilities. The 20/30 PV™ microspectrophotometer combines the latest technologies to allow the user to measure UV-visible-NIR range transmission, absorbance, reflectance, emission and fluorescence spectra of sample areas smaller than a micron across. Even the thickness of thin films and colour spaces may be determined. And while microspectra™ are being acquired, the sample may be viewed with high-resolution digital imaging in the deep UV, in colour or in the near infrared. Ease of use features also add to the power of the 20/30 PV system and include everything from improvements in the instruments ergonomics to software to automation. The 20/30 PV microspectrophotometer is simple to use, the measurements are non-destructive and the spectral data is unmatched. This bespoke instrument incorporates the latest technological advances in optics, spectroscopy and software to deliver the superior performance with unparalleled speed and capabilities. The 20/30 XL™ microspectrophotometer integrates advanced spectrophotometers with a sophisticated UV-visible-NIR range microscope and powerful, easy-to-use software. The 20/30 XL™ is able to take spectra and images of microscopic features of very large objects from the deep UV to the near infrared. There is no upper limit to the sample size which makes this instrument perfect for everything from quality control of the largest flat panel displays to film thickness of 300mm wafers to the non-destructive analysis of great artworks. The 20/30 XL microspectrophotometer is designed to non-destructively analyse microscopic features of very large samples when integrated into large scale sample handling machinery. With a spectral range from the deep ultraviolet to the near infrared, analysis of samples can be done by absorbance, reflectance, Raman, luminescence and fluorescence with unparalleled speed and accuracy. 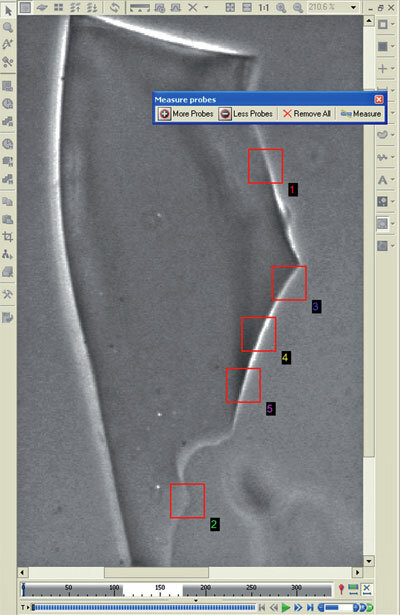 The system can also be configured to image microscopic sample areas in the UV and NIR regions in addition to high resolution colour imaging. FLEX™ is a full-featured yet flexibly configured instrument that incorporates UV-visible-NIR optics, spectrophotometers digital imaging, and software, all tied together with a Lightswitch by CRAIC™ optical multiplexer. With Lightswitch technology, FLEX retains the ease-of-use, while being capable of everything from UV-visible-NIR microspectroscopy, high resolution microscopic imaging, refractive index measurements and more. With an attractive price-entry point, the FLEX microspectrophotometer utilises tested technologies to allow you to measure UV-visible-NIR range transmission, absorbance, reflectance, emission and fluorescence spectra of microscopic sample areas. And while microspectra™ are being acquired, the sample may be simultaneously imaged with a high-resolution colour digital imaging system or through eyepieces. Additional features may also include measuring the refractive index of microscopic samples as well as microcolourimetry and microspot thin film thickness measurements. With an attractive price-entry point, the CRAIC Elixir™ microspectrophotometer utilises tested technologies to allow you to measure transmission, Raman, reflectance, polarisation and fluorescence spectra of microscopic sample areas. Elixir incorporates superior optics, the highest quality spectrophotometers, high resolution digital imaging, and cutting edge software. This is all tied together with Lightswitch by CRAIC™ optical multiplexer. With Lightswitch, proprietary technology, Elixir retains the ease-of-use for which CRAIC instruments are known, while being capable of everything from UV-visible-NIR microspectroscopy, high resolution microscopic imaging, refractive index measurements and more. With an attractive price-entry point, the Elixir microspectrophotometer utilises tested technologies to allow you to measure transmission, Raman, reflectance, polarisation and fluorescence spectra of microscopic sample areas. And while microspectra™ are being acquired, the sample may be simultaneously imaged with a high-resolution colour digital imaging system or through eyepieces. Additional features may also include measuring the refractive index of glass fragments as well as microcolourimetry. The Elixir is built to yield superior quality images and spectra by many different methods all for an attractive price. The 508 PV™ Microscope Spectrophotometer is designed to add spectroscopy, colour imaging, thin film thickness measurement and colourimetry capabilities to your optical microscope or probe station. The 508 PV™ Microscope Spectrophotometer is designed to add spectroscopy, colour imaging, thin film thickness measurement and colourimetry capabilities to your optical microscope or probe station. It can also be used to upgrade an older microspectrometer with cutting edge optics, electronics and software. The 508 PV attaches to an open photoport and enables you to collect transmission, reflectance, polarization or even fluorescence and luminescence spectra of microscopic samples. Featuring Lightblades™, the 508 PV spectrophotometer has a usable spectral range from the ultraviolet to the near infrared. With the 508 PV, you can acquire high quality spectra of even sub-micron samples rapidly, non-destructively and with ease. The 508 PV Microscope Spectrophotometer is ideal for diverse applications such as colourimetry of pixels on flat panel displays, reflectometry of vitrinite coal and source rock, or thin film thickness measurements of optics and semiconductors. The 508 PV is also a cost effective way to upgrade older microspectrometers to the latest hardware and software. The 308 PV™ attaches to an open photoport and enables you to collect transmission, reflectance, polarisation or even fluorescence and luminescence spectra of microscopic samples. The 308 PV™ Microscope Spectrophotometer is designed to add spectroscopy, colour imaging, thin film thickness measurement and colourimetry capabilities to your optical microscope or probe station. It can also be used to upgrade an older microspectrometer with cutting edge optics, electronics and software. The 308 PV attaches to an open photoport and enables you to collect transmission, reflectance, polarisation or even fluorescence and luminescence spectra of microscopic samples. Featuring Lightblades™ spectrophotometer technology, the 308 PV spectrophotometer has a usable spectral range from the ultraviolet to the near infrared. With this instrument, you can acquire high quality spectra of even sub-micron samples rapidly, non-destructively and with ease. The 308 PV Microscope Spectrophotometer is ideal for diverse applications such as colourimetry of pixels on flat panel displays, reflectometry of vitrinite coal and source rock, or thin film thickness measurements of optics and semiconductors. The 308 PV is also a cost effective way to upgrade older microspectrometers to the latest hardware and software. The Apollo™ Raman spectrometer is perfect for rapid, non-destructive analysis in fields such as life sciences, materials science, chemistry and physics. The Apollo™ Raman spectrometer is designed for fast, easy micro-Raman spectroscopy. 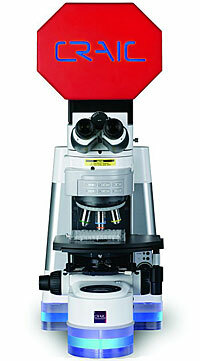 As such, it is perfect for research, metrology and inspection of microscopic sampling areas by Raman spectroscopy. This Raman spectrometer employs optics, software and hardware optimised for Raman spectroscopy of microscopic samples. The Apollo Raman spectrometer is perfect for rapid, non-destructive analysis in fields such as life sciences, materials science, chemistry and physics. The Apollo Raman microspectrometer features a modular design. Each module includes laser excitation, optical interface, Raman spectrometer and software. Modules are offered with different lasers wavelengths and can be used together for the ultimate in experimental flexibility. With an all solid state design, The Apollo Raman microspectrometer is able to measure Raman scattering from microscopic samples quickly, easily and non-destructively. This Raman system is durable, easy to use, highly sensitive and economical to own and operate. 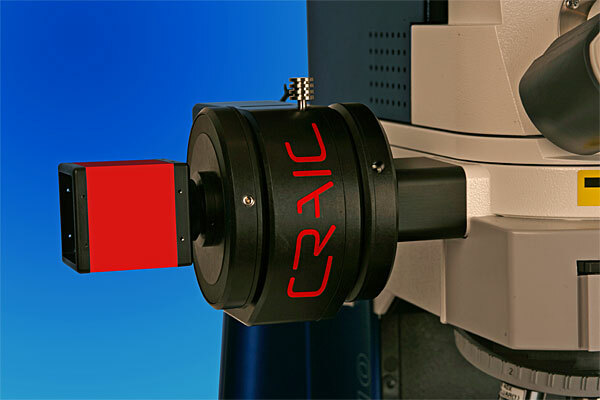 The CRAIC MP-2™ Microscope Photometer is designed to add photometry and imaging to your optical microscope. It is limited only by the microscope itself. The MP-2™ Microscope Photometer is designed to add photometry and imaging to your optical microscope. 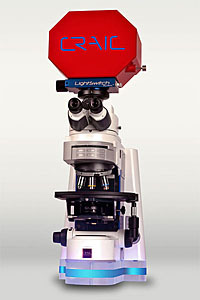 It is better described as a microscope radiometer in that it has a spectral range from the deep UV to the near infrared. It is limited only by the microscope itself. This microphotometer attaches to your microscope and enables you to collect transmission, reflectance or even fluorescence and luminescence photometric data of microscopic samples. The solid state detectors have dynamic ranges and sensitivities greater than PMTs or imaging systems. With complete software control, either broad- or narrow-band photometric intensity measurements can be made. Additionally, with the use of reference materials, precise photometric intensities can be recorded relative to the reference material. With the MP-2 microphotometer, high quality photometry of even sub-micron samples can be done quickly, non-destructively and easily. This system rapidly measures vitrinite reflectivity and also has the ability to do other types of spectroscopic and petrographic analysis and imaging. D2798. This microphotometer is configured to measure the reflectance from coals, kerogens and petroleum source rock. However, it also has a very flexible design. 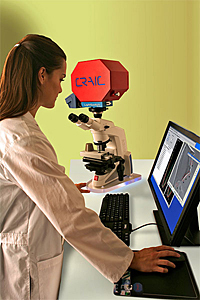 The CoalPro II was developed anticipating the next generation of test protocols as well as for fluorescence and micro-imaging. 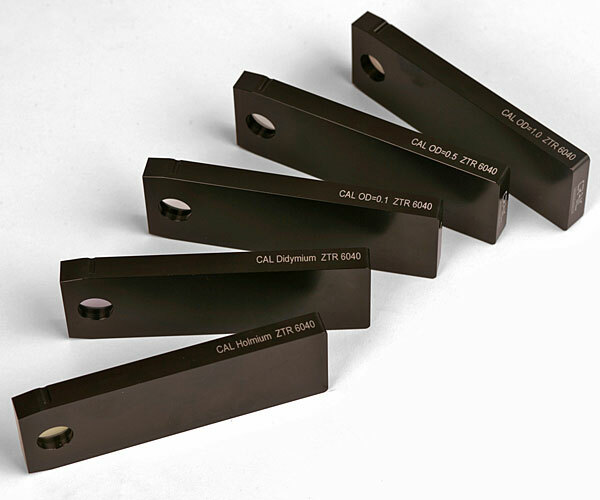 Incorporating a new optical detector and CRAIC CoalPro™ software, the CoalPro II system grades the energy content of coals, kerogens and petroleum source rock using the ISO 7404 and ASTM D2798 standard test methods. It also gives you the ability to collect full colour images of each measurement location in addition to full automation if desired. The CoalPro II™ can also be upgraded to a full 308 Coal™ microscope spectrophotometer to measure the full reflectance spectrum and the spectral fluorescence from coal, kerogen, petroleum source rock and other petrochemicals. With no moving parts, the CoalPro II is durable and user friendly. Designed with flexibility and speed in mind, this system rapidly measures vitrinite reflectivity and also has the ability to do other types of spectroscopic and petrographic analysis and imaging. With this flexibility of design, it will easily comply with future changes in coal testing methods and experiments. The UVM-1™ is a UV microscope that also can image in the visible and NIR. 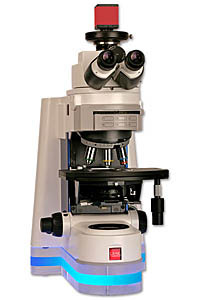 The UVM-1™ is a UV microscope that also can image in the visible and NIR. 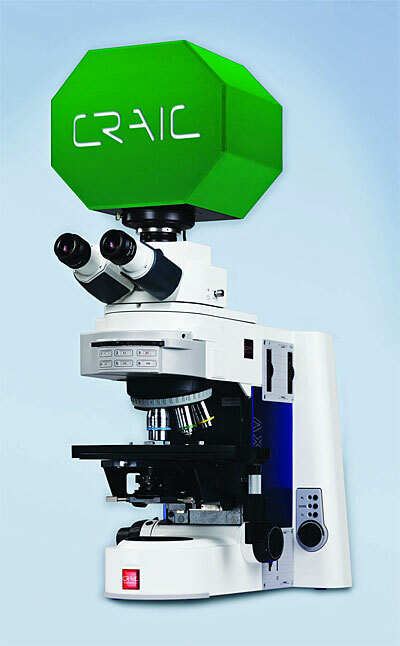 This UV-visible-NIR microscope embodies both advanced optics for cutting edge UV, colour and NIR imaging and visualisation. The system is a flexible design, very easy to use and very durable. 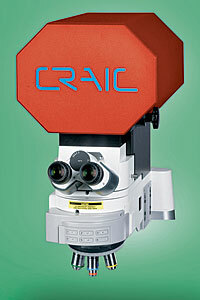 It is designed with cutting edge CRAIC optics for the highest image quality and to give years of service. The UVM-1 UV microscope can image in transmission, reflectance, polarisation and even in fluorescence from the UV, visible, and NIR regions with high spatial resolution, all with the same microscope and without swapping components. 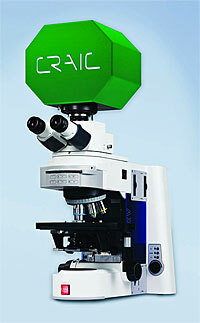 rIQ™ is designed to measure and quantify the refractive index of microscopic fragments of glass. rIQ™ is designed to measure and quantify the refractive index of microscopic fragments of glass. rIQ is built based upon the thermo-optical methodology defined by ASTM E1967. As such, it is an automated system which measures the refractive index of microscopic glass fragments by monitoring the change in refractive index of calibrated oils as they are heated and cooled. Warsash Scientific offers standards specifically for microspectroscopy along with standards vitrinite reflectance and colourimetry. 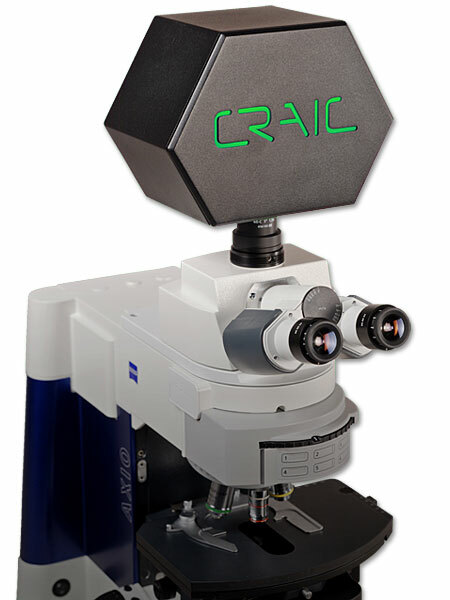 CRAIC Technologies™ is the leading manufacturer of standards for microspectroscopy, including standards traceable to NIST Standard Reference Materials. Warsash Scientific offer standards specifically for microspectroscopy along with standards for vitrinite reflectance and colourimetry. 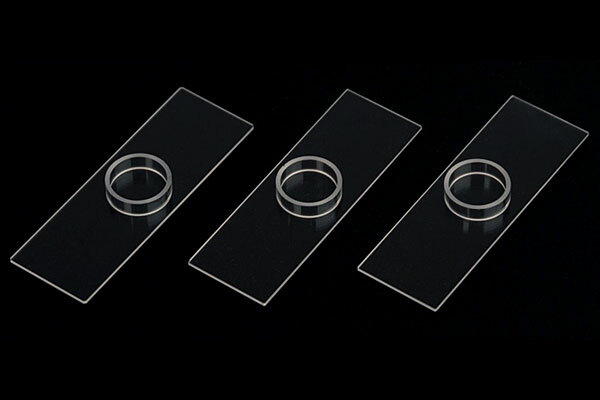 Because of their unique design, these standards have much higher precision when used with microspectrophotometers. Warsash Scientific offer many hardware packages for different applications and requirements. Warsash Scientific offer many hardware packages for different applications and requirements. Hardware packages range from powerful automation solutions to many types of standards. 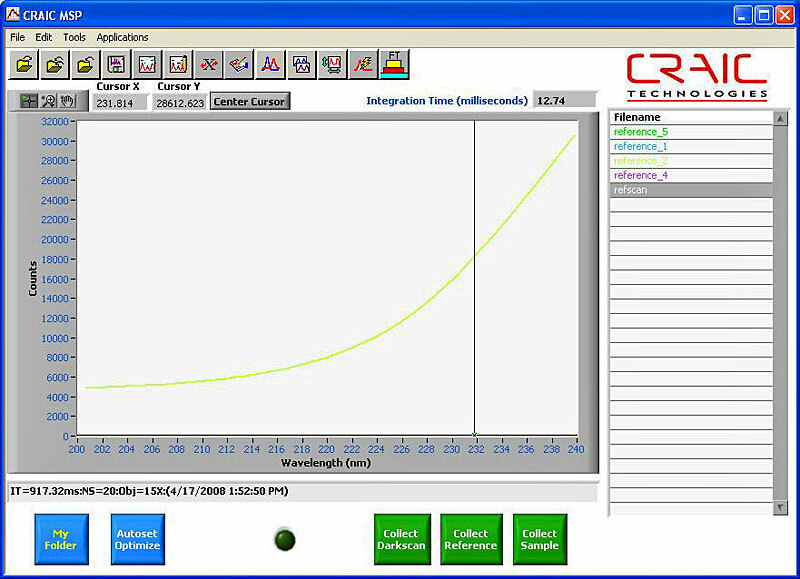 All our packages are integrated with CRAIC instrument control software and their range of microspectrophotometer and microscope spectrometer instruments. Warsash Scientific offer many software packages for different applications and requirements. Software packages range from powerful spectral and image analysis to the ability to calculate thin-film spectra. Many can operate either standalone or as plug-in packages compatible and integrated with our microspectrophotometer control software. CRAIC Technologies™ can custom software to you needs. 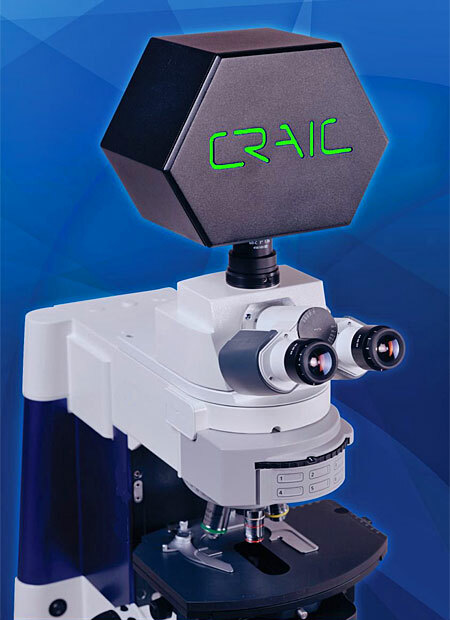 Microspectrophotometer, UV-visible-NIR microscope and Raman microspectrometer consumables are certified by CRAIC Technologies to be of the highest quality and are designed for use with CRAIC microspectrophotometers and microscopes. CRAIC Technologies™ certified consumables are the only ones tested and approved for use with CRAIC Technologies products. Only CRAIC certified consumables can be used with instruments covered by CRAIC warranty or service contracts.